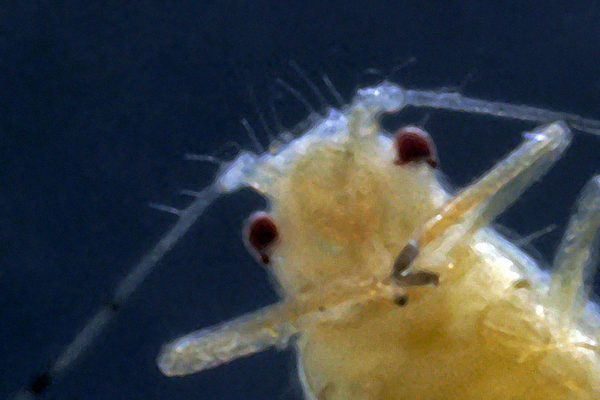 The first micrograph below shows the only 2 long hairs on antennal segment III; the second shows the pale hairs on the abdominal segments. Pterocallis alni is a member of the aphid family Callaphididae. 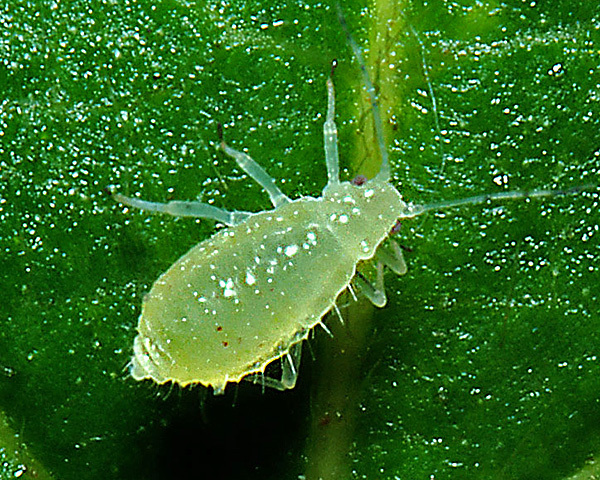 It is a small pale green aphid, viviparous forms of which may be apterous or elate. It is not ant-attended and lives under leaves of alder (Alnus glutinosa). 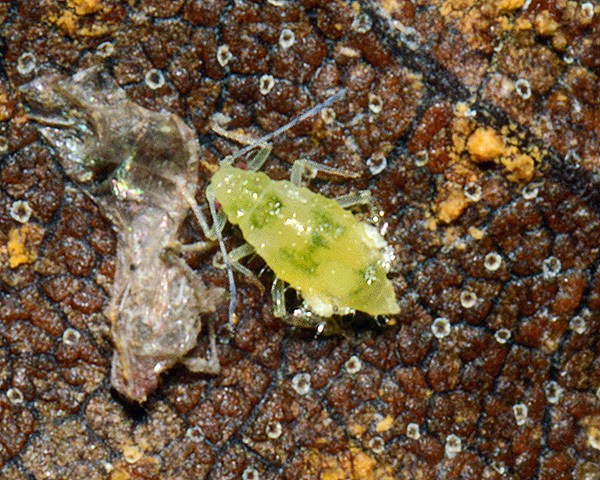 Overwintering occurs as eggs, these being laid in crevices in the bark of its host plant. Eggs are covered with powdery wax, secreted from large wax gland fields situated ventrolaterally below the siphunculi and applied during oviposition. Eggs hatch in spring producing fundatrices which are apterous. 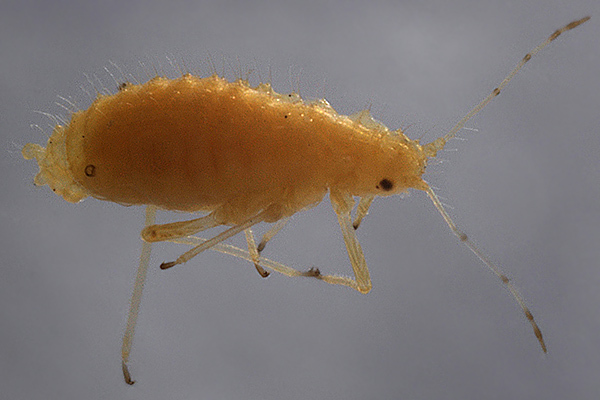 These give rise to generations of viviparous aphids which may be apterous or alate. Both forms can occur within one generation. The picture below shows some apterous and (future) alate immatures. Pterocallis alni isholocyclic, so with the onset of autumn winged males and apterous oviparae appear and eggs are again produced. The ovipara shown below was observed in late November. Early in the season, both apterous and alatae Pterocallis alni are usually a fairly uniform pale green colour, as shown in the pictures at the top of this page. Later on, however, they may have darker green blotchy markings on the dorsum, reminiscent of the markings of Pterocallis maculata. 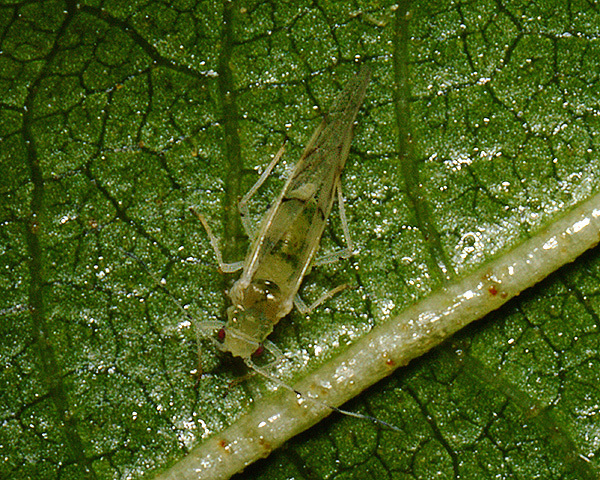 An adult aptera is shown below. The presence of the dark green markings prompted us to check the identification of these aphids, which confirmed their identity as Pterocallis alni. Alatae (shown above) may have similar darker green markings. Gange (1985) studied the population dynamics of Pterocallis alni. 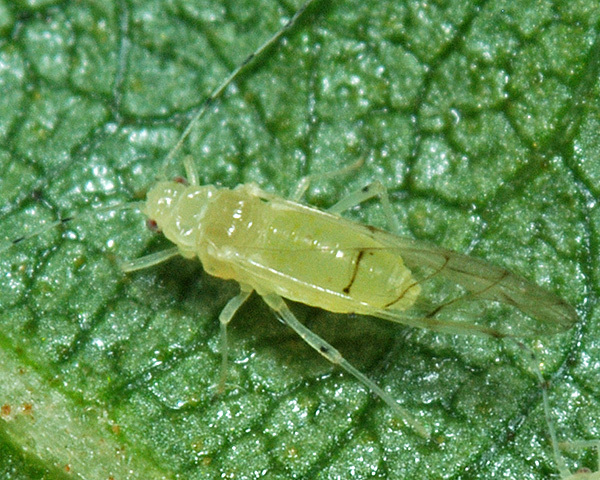 In May aphid populations start to increase. A high initial population resulted in a peak in mid July, low initial numbers resulted in a peak in early August. Pterocallis alni is polymorphic, and crowding results in the production of winged individuals. The crowding stimulus acts pre and post natally. Flight is stimulated by crowding and emigrating alatae colonize other alder trees. An immature alate is shown below. 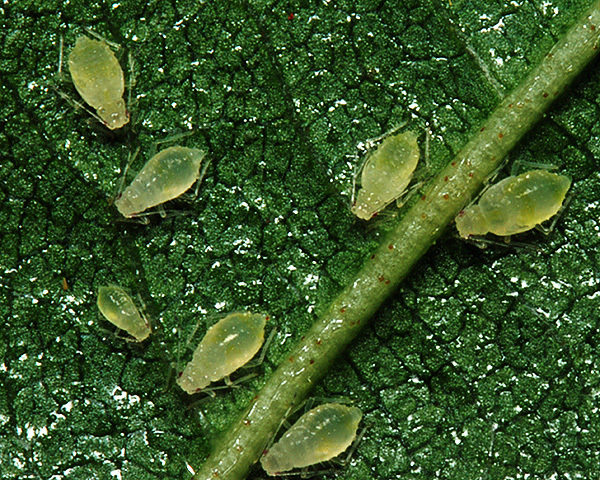 The food quality of alder leaves for the aphids deteriorates in early summer. Poorer food, rising temperatures and increased crowding result in smaller aphids which are less fecund. Recruitment to the population falls and numbers collapse when emigration exceeds recruitment. Pruning of the windbreaks can alter the population cycles of the aphid. 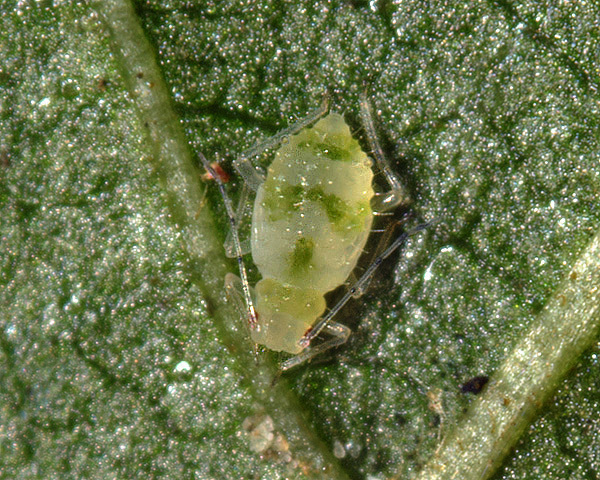 Sexual forms of the aphid are produced as a response to a shortening of the day length in autumn. 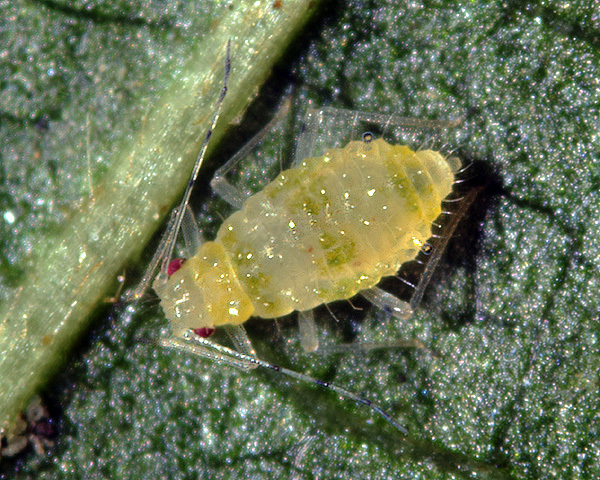 In field conditions adult aphids produce a reproductive sequence of virginoparae (=parthenogenetic viviparae), males, and finally oviparae. Egg laying and distribution were examined and winter mortality monitored. Arthropod predators were the main cause of egg loss and greatest mortality occurred in early winter. The main predator of immature and mature Pterocallis was the black-kneed capsid bug (Blepharidopterus angulatus). The emigration of Blepharidopterus angulatus from alder is closely synchronized with the abundance of Pterocallis alni. Pterocallis alni has been recorded from 12 Alnus species. Blackman & Eastop list about 50 species of aphids as feeding on alders worldwide, and provides formal identification keys for aphids on Alnus. Of the 8 species that occur on common alder (Alnus glutinosa), Baker (2015) lists 7 aphid species as recorded in Britain: Clethrobius comes, Crypturaphis grassi, Glyphina betulae, Pterocallis alni, Pterocallis maculata, Stomaphis quercus and Stomaphis wojciechowskii.